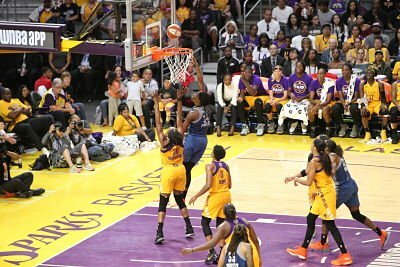 Sylvia Fowles elevates over Nneka Ogwumike to score. Photo by Benita West/TGSportsTV1. 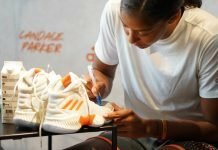 Los Angeles – Faced with elimination, the Minnesota Lynx stormed back Sunday to dominate the Los Angeles Sparks in Game 5 of the WNBA Finals, 80-69, and even the series at 2-2. 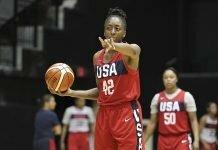 Sylvia Fowles led a dominating effort by Minnesota with 22 points and 14 rebounds, while Rebekkah Brunson added 18 points and 13 rebounds and Maya Moore scored 15 points. The Lynx out-rebounded their opponents, 48-28, and outscored them in second-chance points, 21-5. The Sparks, who had a chance to win the title on their home court for the second consecutive year, again botched the opportunity with out-of-sync play. A stepped-up Minnesota defense forced the hosts into settling for outside shots – most of which they didn’t make. Los Angeles shot as low as 33 percent in the first half of play. Brunson said rebounding was the difference for her team. The Sparks struck first, scoring back-to-back buckets. But Seimone Augustus, who was scoreless in Game 3 and Maya Moore, who put up her points in the last half of that matchup, helped Minnesota pull to a tie twice before an Augustus three-point shot gave them a four-point lead at the 3:03 mark. They never trailed again. The Lynx lead mounted to 19 points in the third period, and Los Angeles was able to cut the deficit to eight points twice in the fourth, but could get no closer. Odyssey Sims led the Sparks with 18 points, while Nneka Ogwumike scored 17 and Candace Parker, 11. Lynx coach Cheryl Reeve said her team was up for the challenge, which will send the series back to Minnesota for a winner-take-all Game 5. Los Angeles coach Brian Agler said Minnesota was the more aggressive team in the game. Sparks guard Alana Beard said the Lynx wanted the win more. “They didn’t want to go home, and they played as if they wanted it more, in terms of how they rebounded and did all the little things it takes to get the win,” Beard said. The series parallels the Finals last year, with Los Angeles winning Games 1 and 3 and Minnesota taking Games 2 and 4. Wednesday’s Game 5 will tip at 7 p.m. CT on ESPN.